Trees. Trees seem to be the flavour of the month for many photographers, particularly if you take a brief tour through Twitter. Trees with mist, trees with rain, trees with moss, trees with moss and mist....they seem to have replaced coastal long exposures and sunsets. It's not that I don't like them, I happen to think that forests and woods can be very beautiful, and contain a myriad of scenes. I'm just finding at the moment that for an amateur photographer, such as myself, we're found wanting for variety and inspiration from the pros we look to. The images they take are beautiful, but they're also extremely similar to each other, and to images from less well known photographers who do not receive the same attention and praise. Perhaps this is something to consider, perhaps not... 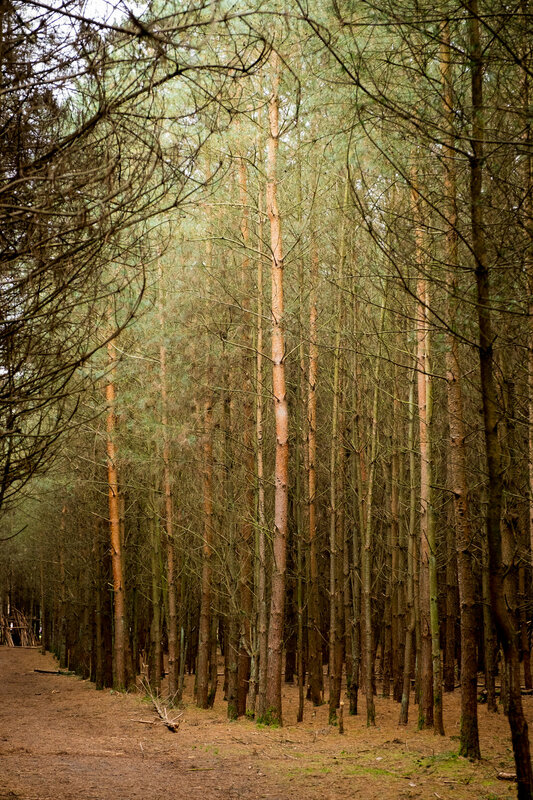 Anyway, I did actually make some images whilst on an Autumnal walkabout in Thetford forest in Suffolk. As is often the case for people with a day job outside of photography, opportunities for making images often crop up on outings and trips away, rather than being planned for specifically. Therefore, often we have to make do with the light that is given and focus on details and colour in the scenes, rather than colour from the sky. This is always an interesting challenge, and one I enjoy trying to tackle. Using the Fuji X-T1 was again an exciting (yes, I know it is an electrical device) experience, it is so comfortable to use and create with. The files from the Fuji are also beautiful - the Acorn image above received the bare minimum in terms of editing (contrast +10, highlights +17, vibrance +12). It is brilliant, and I am looking forward to hiking with it in Snowdonia this Christmas. Apart from the details, often if you go deep enough into the forest, you can stumble upon great scenes where the sky doesn't matter (as long as the lighting is not too harsh!). The leaves were on the turn when we went, but many of the trees in Thetford are pine and so the colours are less abundant. However, the contrast between the yellowing ferns on the forest floor and the grey/brown of the pine trunks was lovely. As an extra challenge, I'm lately trying to make myself use a technique that is new to me, and on this trip it was intentional camera movement. Trees are perfect subjects to begin with, as they naturally lend themselves to vertical movement, and they seem to be more forgiving to timing or movement errors! I was quite pleased with the results, the movement seemed quite straight so the trees didn't look too wonky. I even like the spooky shadows of the log pile that was on the floor in the bottom right of the image! This is definitely something I will play around with again. I was at times frustrated in the forest. There were lots of people in places, and as I have said before the light was not the best. However, I feel the images represent the forest pretty well in situations where most of us will see it, and...well, I like them, which is all that counts, right? Thanks for reading - if you enjoyed this please consider sharing.